Today we arrive. Many emotions.To excited to even think about writing this. We have travelled from a barren windswept, lava field of an island to the lush green verdent perfect island of Antigua. We were probably ready to arrive four days ago, but before that we could have carried on forever. Now that end is in sight we are all rady to arrive. And we have had one of the signature sails of the trip today. Wind on the beam and sun in the sky. Arrival in English harbour was a great event. It is one of the most beautiful arrivals I have ever made. Coming around the corner into the bay, seeing boats moored everywhere - from nothing to everything all in the space of a few minutes, is quite an amazing shock. Then all of a sudden we are moored stern to the quay in Nelsons Dockyard lying to the anchor and stepping into a bar gulping down the first beer of many that evening. Liz and kds came down to see us which was a lovely tihng for me. Crew all happy to be here, and more than happy to be catching the flights back on time. We have been visited by some great Atlantic seabirds though given the thousands of square miles we have surveyed I'm surprised we haven't seen more. I am minded of Peter Blake's comments of how the Oceanic birds have dwindled over the last 2 decades. The commonest species we've seen have been the Wilson's Storm Petrels which are the size of a small wader and have followed us for miles and miles. 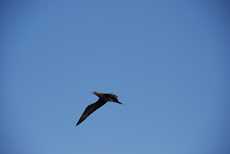 They whiz around just above the water and have a flight very like swallows and are friendly sociable little birds. The White-Tailed Tropic bird which are one of the prettiest sea-birds I've come across. Looking a little like a dainty frigate-bird these very beautiful birds have often visited us in pairs. They have black chevrons on their wings and long white streamer tails. They are characteristically attracted to passing boats and one of two have so nearly landed on Pacific Bliss - only cries of Look! Look! Look! from Giles probably putting them off.